In my one year of blogging about personal finance, I discovered that most people started, ‘reconnecting’ with their money when they felt discomfort with their current financial situation. Whether it was paying off their student loan debt, paying off their mortgage or becoming super savers so they can retire by 30, or 40 years old, they all were uncomfortable with the way they were currently living or just wanted more for their life. As they began to find ways to increase their income by earning money online or cut back on their expenses, they changed their behaviors towards money and started or stopped doing certain things that have made them successful with their money. The savings goal is simple, every day for one month you put the equivalent dollar amount equal to the date into your savings/investment account. 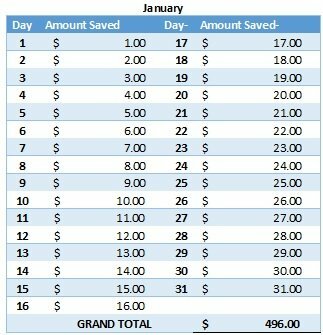 Here is an example for the month of January: In completing this challenge, you would have saved $496 in January. 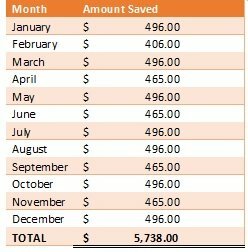 If you were to continue with this savings challenge for the entire year, you would have saved over almost $6k during the year (see below). It motivates you to organize your home. It is similar to the saying ‘if you want to make sure your house gets cleaned, invite guests over’. The decluttering challenge forces you to get organized. Less physical and emotional stress. I have heard it said before that you can tell the state of someone’s mind from the state of their home. If you feel that you are being pulled in a million directions, it is very likely that your home may reflect this. The act of decluttering our things (a physical act) can spill over into psychological and emotional ways and provide us with clarity and focus. Reminds you of what you do have: When you declutter, you are also taking an inventory of the physical things you have in the home. This exercise can help you notice you bought the same thing twice, you actually have something at home that you were planning on buying, you spent a lot of money on stuff you didn’t need or want. 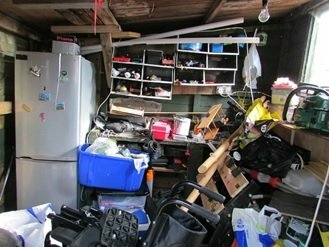 Similar to the savings goal challenge, for every date of the month you get rid of the equivalent number of items in your home, as the date of the month. You can decide to sell, throw out or donate these items, but the idea is to make sure they leave your home by the end of the month. The journal of consumer research completed a study that showed people who were more grateful or displayed gratitude were more likely to be content and this contentment translated into increased delayed gratification. Delayed gratification is critical in reaching most financial goals as it takes sacrificing the now for the later over a period of time. This makes sense because when gratitude leads to contentment, we are less likely to compare ourselves with others and try to live up to other people or societies expectations of what it means to be successful. When we reduce our influence of society’s expectations of us, our financial decisions better reflect our values and what we truly feel is important, not what others think we should have. Get a small gratitude journal to write your thoughts. Or you can staple a bunch of papers together. The idea however, is to keep your notes in the same place so you can reflect on them over time. Every morning when you wake up, write at least 5 things in your life that you are grateful for (try and make them different each day). They don’t have to be money focused. Consider both the big and small things that you may even take for granted (i.e. your spouse, health, job, finances, gifts or talents you may have etc.). At the end of the same day, spend 5 minutes reviewing your journal and reflecting on what you do have. To make this exercise even more effective, commit to not complaining during the gratitude challenge. It is difficult to be grateful and complain at the same time. Keep a note (you can jot it down or remember in your head) of how many times you complained each day and write that number down in your daily entry. If you can remember what you complained about, write that down as well. By writing down the number of times you complained and even what it was about, you can spot patterns and bad habits that may be hindering your success. Examples of complaints can be about the weather, health, finances, spouse, co-workers etc. The overall objective of the gratitude challenge is to remind you of the positive things in your life, so you can focus on those and build more positive outcomes. Figure out how much you plan on spending on your variable expenses. These would include: groceries, gas, eating out & entertainment money, couple’s activity etc. Withdraw the exact amount and distribute the amounts for each budget line item in separate envelopes or jars. Repeat this process each paycheck. If you have any money left in any of the jars at the end of the challenge, you can put them towards savings or debt repayment. The shopping challenge is when you commit to not buying or paying for anything outside of your food, shelter and transportation. This combination as well as the decluttering challenge allows you to review the items you current possess, determine if they have any value to you and find creative ways to use what you already have instead of buying the latest item in store. Instead of committing to a ‘full’ shopping ban, some people commit to not buying specific things during the duration of the ban. The most common being the cloth shopping ban. This challenge is meant to show that even the $2-$5 cup of coffee, purchased twice a day can cost a lot of money in the long run. The challenge encourages participants to make their beverage at home or work instead. The savings they get for not buying their tea/coffee they put towards their savings or debt repayment plan. This challenge is most effective if you regularly buy your tea, coffee, or any other beverage instead of make it at home (or in the office). The couponing challenge focuses on getting the most discount from the things you already buy. While completing the couponing challenge the objective is to search and see where you can get coupons for as many purchases as possible. Search online, look through flyers and use promo codes to get discounts on everyday purchases. The money saved from couponing can be put towards savings or debt repayment. The couponing challenge is most effective if there is a strategic couponing system in place. This includes knowing where and when to search and a strong organization system to keep the coupons in order. Here’s our list of extreme couponing tips for extra inspiration. These challenges provide different ways to learn about your spending habits, save money and learn effective ways to cut spending, find deals and reconnect with your money. With each money challenge offering different opportunities to learn, money challenges serve as a great way to motivate someone to manage their money better. Having an accountability partner when completing these challenges will help in staying motivated during the process.